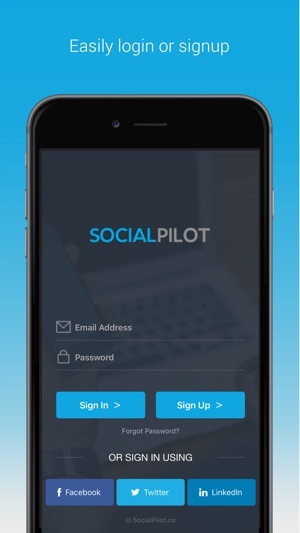 SocialPilot is a social media scheduling & marketing tool that automates your content sharing across Facebook, Twitter, LinkedIn, Google+, Pinterest, Instagram, Tumblr, Vk and Xing for agencies & social media professionals. Hopefully, we are able to cover the vicinity for making your social presence more efficient, fulfilling your social media needs! 1. 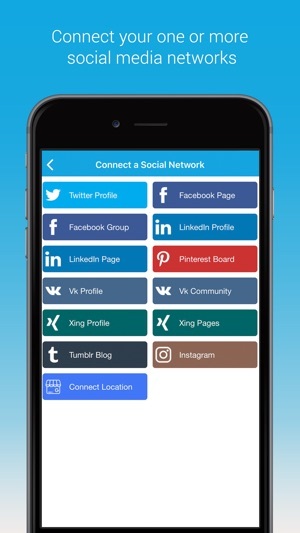 Connect Multiple Social Media Profiles: You can connect up to 200 social media profiles, pages, and groups all at one place. 2. Custom Facebook Branding: Increase your brand visibility on your Facebook profile and groups with SocialPilot. Publish content with your brand name instead of SocialPilot’s. 3. Higher Sharing and Queue Quota: It is a perfect tool to plan your content sharing strategies for the whole month ahead. 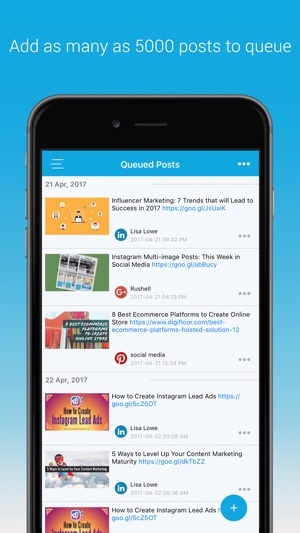 Share up to 1000 posts per day having future queue up to 10,000 posts. 4. Team Collaboration: SocialPilot enables you to add team members and allow them to schedule, approve and share all posts collaboratively. 5. Browser Extension: SocialPilot allows you to easily share content from other apps like Flipboard, Pocket, Pulse etc. anytime, on the go. 6. Client Management: Manage your clients’ social accounts without exchanging their account credentials or being an admin hassle-free. 7. Bulk Scheduling: Schedule up to 500 posts together with this mass planning feature where you can bulk upload images as well. 8. Social Media Analytics: Actionable analysis to analyze just everything of your account efficiently. 9. Content and Feed: Never run out of fresh new content with content suggestions and keep your audience engaged by sharing your RSS feed content timely. 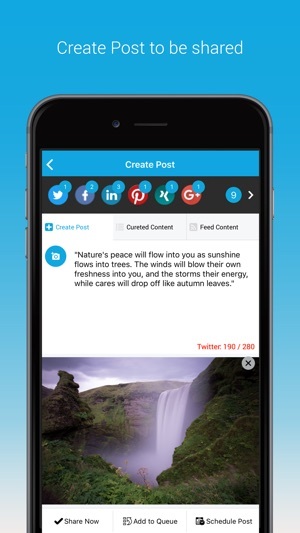 • Easily create & schedule a post using text, images, links or a mix of all of it. • Easily re-share and reschedule your already delivered posts. • A User-friendly interface that can be used by anyone. • You will receive notifications when your post generates an error. 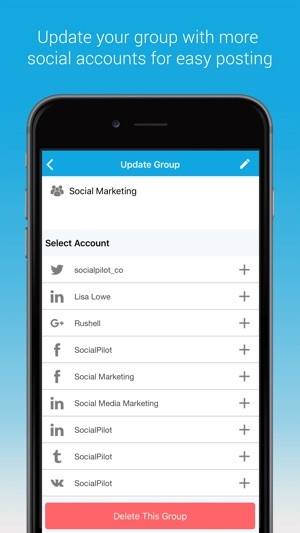 SocialPilot has a free plan, but you can easily upgrade within the app. Payments will be charged to your iTunes account after confirmation of purchase. Your subscription will automatically renew unless canceled at least 24-hours before the end of the current period. Your subscription can be managed in your iTunes Account Settings after purchase. Subscriptions cannot be canceled for the current active period. So what are you waiting for? 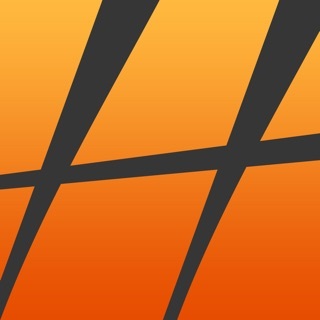 Just download and give it a try! I was using buffer app before but after exploring SocialPilot app, I like its easy to use features and nice design.